The match began with the crowd making their presence felt through booming songs and cheers, but the match immediately began in favor of United. Wayne Rooney was missing his first appearance of the season, but early in the match Javier Hernandez looked to make up for Rooney’s absence by finding himself in on goal just three minutes into the match. Jonathan Woodgate came in from behind and appeared to lean on Chicharito before getting a foot to the ball, before it was smothered by Stoke keeper Asmir Begovic. 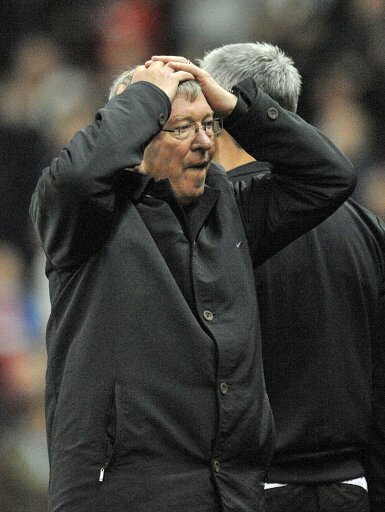 Despite Sir Alex Fergueson’s pleas for a penalty, none was given and the match continued, while Hernandez could not, and was substituted minutes later. Both sides enjoyed half chances for the next twenty or so minutes before a breakthrough came, but nobody was surprised by the source. In the 27th minute, Nani began his run through the Stoke defense beating a defender off the dribble before playing a one-two with Darren Fletcher left Nani to cut in and finish. The goal was reminiscent of the one the Portuguese national scored a week ago, and it was the breakthrough that United needed if they were going to walk away from the Britannia with a result. Stoke’s chances increased as the first half went on, with Rory Delap narrowly missing wide and an on target effort by Jonathan Walters pushed around the post by David De Gea. The first half would end with United clinging to their 1-0 lead. Stoke City came out from half-time looking determined to get points from this match and it did not take long for them to get the goal they needed. After a corner was conceded by United, Peter Crouch rose above the rest to get his head to a Matthew Etherington, and bury it in the back of the net. It was his first goal since arriving at the Britannia on deadline day, and the Stoke fans were delighted with his contribution. Just three minutes later, Crouch found himself in scoring position again when Rio Ferdinand misplayed a cross and it fell to Crouch. The beanpole striker controlled it nicely before shooting, but the shot was deflected over the bar by De Gea. The opportunities continued from Stoke, with Marc Wilson crushing a free kick from outside the box right at De Gea, who deflected the ball clear again. United were not without opportunities of their own, with an Ashley Young shot blocked by Begovic, but immediately after a Patrice Evra blast appeared to hit Stoke captain Ryan Shawcross in the hand, but once again United’s shouts for a penalty were denied. Both team enjoyed late opportunities, but neither was able to score and while Manchester United remain undefeated, their 100% record came to an end.